As from 2019, Linnaeus University's Academic Ceremony takes place on the first Friday after "Carl Day", every other year in Kalmar and every other year in Växjö. Next year, Linnaeus University's Academic Ceremony will be held in Kalmar on Friday, 31 January. New doctors and honorary doctors are conferred, new professors are inaugurated and academic awards are handed out. Below you will find information about the Academic Ceremony and selected parts from the ceremony on 1 February 2019 that was held in Växjö. Once the programme for 2020 is completed this will be presented here. Inauguration lectures in Kalmar by new professors. Inauguration lectures in Växjö by new professors. 16.00 Grand ceremony in Växjö Consert hall with conferral of degrees for doctors and honorary doctors and inauguration of new professors. Open for the public. No registration needed but the number of seats is limited. We ask guests to be seated no later than 15.30. 16:00 Grand ceremony at Växjö Consert hall with conferral of new doctors and honorary doctors and inauguration of new professors. Invitations to the ceremony and the academic dinner are sent out roughly three months before the ceremony. If you have defended your doctoral thesis or been appointed professor you will automatically receive an invitation in the mail. Promovendi, installandi, and all other employees at Linnaeus University who have received an invitation to take part at the ceremony may bring company to the academic dinner at a subsidised price. The number of seats is limited. We recommend that any accompanying guests are at least 15 years of age. There will be bus transports available between Växjö and Kalmar for invited guests and their accompanying guests. If you would like to reserve a seat on the bus you state this in connection to your registration. Rehearsals will be held during the day for all promovendi, istallandi, honorary doctors and other procession participants. More information about this in your invitation. If you wish to stay at a hotel you have to arrange this yourself. Remember to make your accommodation arrangements well in advance to ensure there are available rooms. Refer to our agreement when making your reservation. More information abut hotels in Kalmar will be published on this page. The academic ceremonies originate from the oldest medieval universities in southern Europe and have been arranged at Swedish universities since the 17th century. Linnaeus University held its first academic ceremony in 2010. Every university and university college has its own academic ceremony. The conferral of doctoral degrees is a degree ceremony for those who have defended their doctoral theses during the year. The inauguration of professors is a ceremony with medieval traditions that celebrates the inauguration of professors. At the Academic Ceremony, it is academic achievement that is in focus and the subject of celebration. It is also an opportunity for the university to present its research initiatives to the general public. 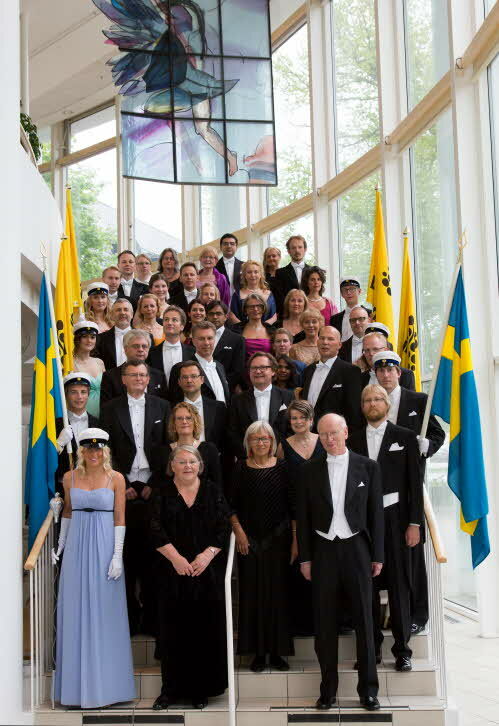 The Academic Ceremony at Linnaeus University is arranged every other year in Kalmar and every other year in Växjö. The traditional professorial public lectures are held in connection to the inauguration ceremony and will involve the participation of all new professors. The inauguration lectures are held at Linnaeus University during the week before the Academic Ceremony. Everyone is welcome to attend these lectures and the conferral and inauguration ceremonies are also open to the public. As with the promotion of doctors, the inauguration of professors originates in the ceremonial practices of the Middle Ages. In Swedish, the inauguration is referred to as installation and the professors to be inaugurated installandi, which originates in the church ceremonies where a member of a chapter was appointed to their office, thereby receiving their own seat in the choir stall, the stallum. Professorial inauguration ceremonies have been held in Sweden since the beginning of the 17th Century, starting at Uppsala University. 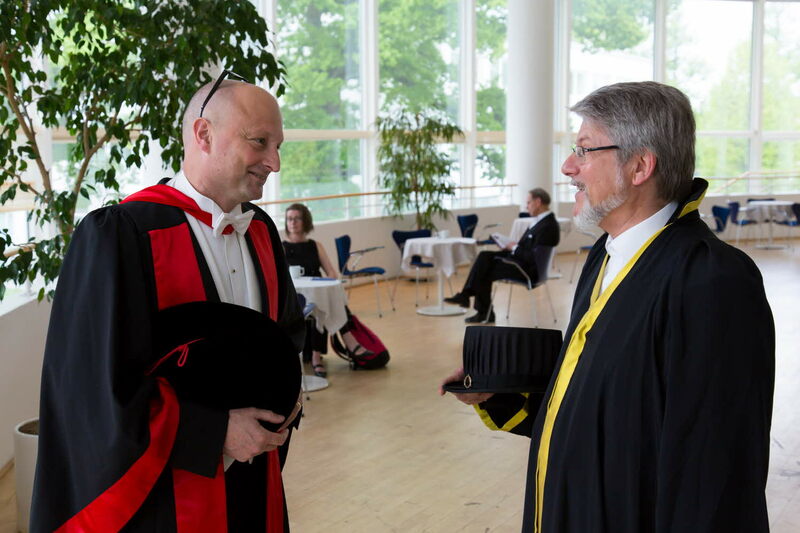 At Linnaeus University's academic ceremony, tenured and adjunct professors are installed who have been offered employment by one of the faculty boards during the previous year. Participation in the professorial inauguration is on a voluntary basis. It is the vice-chancellor of the university that inaugurates the professor. The format of the inauguration ceremony has over the years come to encompass two broad aspects. The first aspect is a form of welcome, a mark of acknowledgement from the circle of professorial colleagues. The other and most important aspect is to focus attention on the subject area concerned, as a format for the dissemination of research information. Professors to be inaugurated will have the opportunity to give a shorter scholarly lecture, a so-called inauguration lecture. Inauguration lectures are normally held immediately prior to the Academic Ceremony, during the same week, and are open to the public. The dates for inauguration lectures in 2020 have not yet been established. At Linnaeus University, doctoral degrees are conferred following the fulfilment of examination requirements, that is to say that doctoral students have successfully defended their theses during the previous calendar year and applied for their degree. The conferral of doctoral degrees is acknowledged as the most important and traditional of academic ceremonies. The act of conferral is a degree-awarding ceremony with origins in the oldest medieval universities of southern Europe. The first documented degree conferral in Sweden was held in Uppsala on 22 January 1600. In Lund, the first ceremony was held in 1670. Other Swedish universities and higher education institutions were etsbalished much later and, as a result, started with their ceremonies much later. The word promovere literally means to launch or push forward, but in this context the word is most closely related to promoting to higher office. Those participating in the conferral ceremony are referred to as promovendus, promovenda, plural promovendi. Following the ceremony, candidates are referred to as promotus, promota, promoti. During the course of the ceremony, the university awards the insignia of the doctorate in the form of a doctor's hat or laurel wreath, ring and degree diploma. The insignia are symbols that are awarded at the degree conferral ceremony. The insignia have a symbolic meaning and consist of: laurel wreath or hat, ring and diploma. 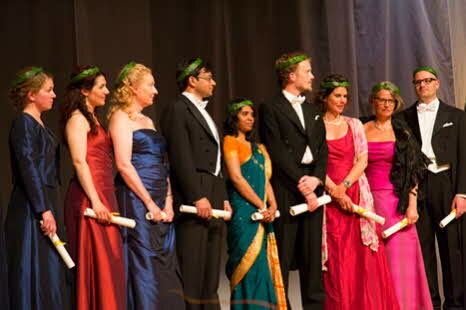 At Linnaeus University, the laurel wreath and diploma are awarded to all participants in the degree conferral ceremony. Newly qualified doctors can purchase hats and rings if they so wish. The laurel wreath is a specifically Swedish academic phenomenon, having no equivalent in countries outside of our cultural sphere. The laurel wreath is awarded for degree conferrals within the philosophical faculty. The laurel wreath was used during Antiquity as a symbol of victory during the Olympic Games. Later the wreath became associated with poetic achievement and wisdom. In this way it is thought that the laurel wreath has been adopted in Swedish academia. According to one theory the laurel wreath is rooted in Swedish Spring folk festivals where a 'May prince' is appointed and crowned with a laurel wreath. The doctor's hat is a black top hat. Hats are decorated with a hat buckle marking university affiliation. 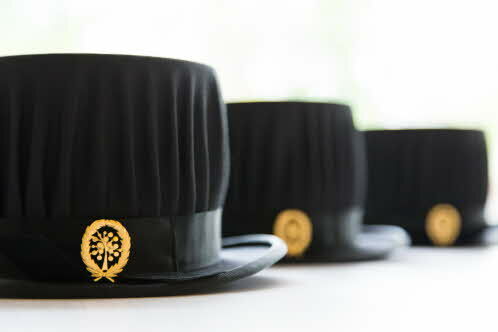 The buckle which is used for Linnaeus University's hats is for doctors from all faculties. It is designed in the form of a laurel wreath with the Linnaeus University tree symbol in the middle. The ring is made of gold and symbolises fidelity; one might regard the conferee as having entered into a state of 'matrimony' with the world of academic learning. The symbols used on the ring are often in line with the symbols used in the hat buckle and for Linnaeus University the rings are decorated with laurels and symbols. The ring is made in 18 carat gold. The diploma was originally a confirmation of the rights conferred on the promoti. Nowadays a modern degree certificate is issued to the candidate in recognition of the academic achievement. The diploma of today is essentially an objet d'art fulfilling a ceremonial function during the degree conferral ceremony. At Linnaeus University honorary doctorates are awarded their degrees at the same academic ceremony where new doctors are awarded their doctoral degrees. The conferral of an honorary doctorate involves the following insignia: hat, ring and degree certificate. The tradition of appointing honorary doctorates, doctores honoris causa, became commonplace at first during the early 1940s. An honorary doctorate can only be awarded at a promotion ceremony. The accepted practice for what sort of achievements can be honoured through the award of an honorary doctorate differs between universities, but it is always the faculties themselves who decide on the award of honorary doctorates. Often this award involves researchers from other countries who have cooperated with the university's teachers but it can also involve other people from outside the academic world whose inclusion in the scholarly community is desirable for various reasons. through his/her cooperation with researchers within one of Linnaeus University's faculties has significantly promoted research. has or has had a decisive influence as a source of inspiration for scholarly development with respect to the university's academic subjects or research environments. has made important literary, artistic or community-beneficial contributions in connection with one of the university's subjects or areas. has carried out an important survey or other research-orientated work without necessarily having an academic degree or doctorate. is or has been a major contributor to the university's international cooperative initiatives involving research and teaching. in some way other than research has particularly promoted the development of one of Linnaeus University's faculties. Persons who have been put forward for this award should not already possess an honorary doctorate with the same designation from any other Swedish university or higher education institution. Furthermore, the university should not be in a clear dependency position in relation to the proposed persons. Events Every year, Linnaeus University organises a large number of major and minor events. You find them in the menu to the right.